We are domestic and commercial electricians working throughout Manchester. We aim to please customers so that they feel happy to use our service again and never to hesitate when recommending us. Phase Electrical (NW) Ltd. is a business which has grown by word of mouth and a good reputation. All our electricians have a good technical understanding and an eye for detail which results in a respected value service. We have lots of satisfied customers which is a credit to our ethos of customer satisfaction which is backed up by guaranteeing any work we carry out. 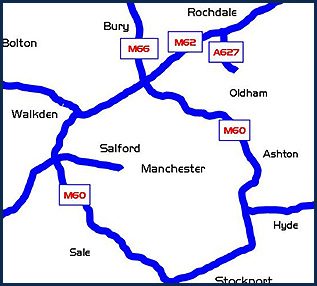 We feel that we offer good coverage for all our customers in the areas we operate and aim to offer a good standard of service where geographical coverage is not a concern. We are pleased to offer free electrical visual surveys. We’ll come and visit you, assess what needs to be done and give you a competitive quotation. Our qualified electricians are able to carry out any testing and fault finding works you require. We produce various test and reports on an array of installations. We understand that dealing with tradesmen can be daunting. We are at the end of the phone to help give you the best advice for your situation so that you are more aware of your options. Old fuse boxes are outdated and can be dangerous if not periodically inspected. Today’s consumer units are made of metal to reduce fire and offer an extra layer of protection for peace of mind. 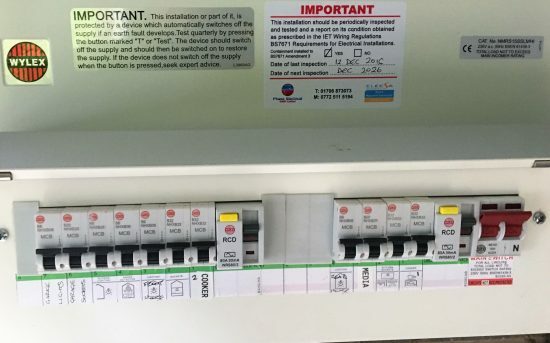 We can advise and carry out full and partial rewires to your requirements and offer the best advice to balance your present requirements and any future additions that may need to be added. We can help with any emergency lighting upgrades or even a full design and install service which uses LED technology to help reduce your carbon footprint and energy costs. We offer a full electrical reporting service which includes issuing a Part P certificate where applicable. At Phase Electrical (NW) Ltd. we have found that keeping control of any jobs we are tasked with is of upmost importance to greatly reduce errors, which can be missed appointments, contact details and work history of a certain address. We use a ‘Client Relation Manager’ (CRM) software package which securely electronically stores all the required information so that any jobs and any special requests are dealt with accordingly. The CRM package helps us keep organised with dates, pricing and job specific information which has greatly reduced the amount of paper based notes we use in the office. We have incorporated a ‘Step Progress’ system within the CRM that enables us to ascertain whether a job is to be booked in, has been quoted for or has been completed, which also includes any relevant associated notes. All our field staff are friendly and polite but above all, for piece of mind, fully qualified. Gable End Farm, Crossley New Road, Todmorden, OL14 8RP.